This post was sponsored by Wal-Mart and contains affiliate links. All made up design terms are my own. I decorate entire rooms and spaces in our homes based on one single design element.I know it sounds kind of crazy but I honestly tend to get stuck on one single element in a space - the rug, the lighting, the art - and once I have that one thing figured out, the rest of the room seems to fall into place in my mind. My last decor obsession was the rug in our living room. Once I decided on the perfect stripe, the rest of the space just seemed to make sense to me. The living room has taken on a Modern Coastal vibe and I think the rest of the house is following along with a Coastal Chic/ Modern Farmhouse blend. I say modern farmhouse because I'm not super into designing with a ton of layers - it kinda makes me feel jittery to have stuff lined up on my kitchen counters - so I'd say we're going with a "cleaner" version of Farmhouse, if that makes sense. And for those of you who are design pros, I beg you not to point out that there is no such thing as Coastal Chic/Modern Farmhouse design style, I totally know that I'm making it up, so just roll with it! Now that the living room is nailed down, I'm moving on to our guest room. Our guest room is actually the room that Justin and I are living in until the Master Suite is complete so I know it will need some major love once we finally move out. Both my parents and my in-laws love to come visit the babes and I can't wait to design a retreat for them - especially since they always give Justin and I a little break when they visit. If anyone deserves to sleep in a pretty space, it's the people who actually want to watch our kids! 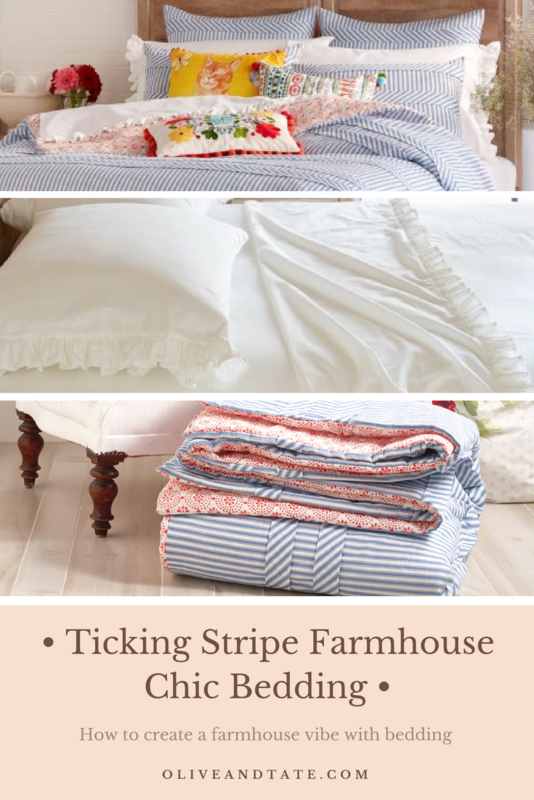 For our guest room, the design item I'm completely stuck on is ticking stripe bedding. I don't know why, but I have to have it. To me, if the bed is made in soft shades of blue and white ticking stripe with a few fun pops of color, the rest of the decor will just fall into place. Both my mom and mother-in-law love color so I'll add in a fun throw pillow just for them (again, anything for the people who want to watch my wild animal babies!). I was shopping around for the perfect ticking stripe set and was not pleased with the prices I was finding online. I want bedding that works for our life so anything that needs to be dry cleaned or costs an arm and a leg is a no for us. Thankfully, I found the Pioneer Woman Ticking Stripe set at Wal-Mart and can't wait to get my hands on it. Her bedding line just launched on October 4th so I'm on standby for the duvet set and shams to land on my doorstep. I tossed in the white Ruffle Sheet Set and Pillowcase set and a ticking stripe throw pillow (or two) and can cross the guest room off of my list! I can't wait to pair the bedding with our wrought iron headboard and our jute rug (an item that has lived in multiple spaces in our various homes!) and finally give our parents a space they can feel comfortable in. And Mom, sorry about the last time you were in town and had to sleep on the couch - to say that I owe you a gorgeous room to sleep in is an understatement!